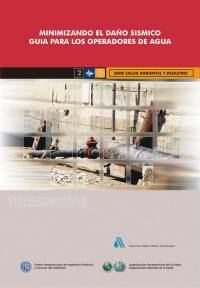 This edition, originally published by the American Water Works Association (AWWA) with the title "Minimizing Earthquake Damage", offers general information on the measures that drinking water companies should take to achieve the required preparedness level to respond effectively to earthquake emergencies. Seismic damage reduction, Guidelines for water companies covers the main and more common issues included in a seismic vulnerability analysis of a water system. First, it describes seismic vulnerability and the objectives of water systems. Next, it describes seismic threats, as well as the vulnerability of the system components, and discusses its global pattern. Finally, it provides the basic principles that water suppliers should take into account during emergency planning and gives an example of vulnerability analysis. This publication is another contribution of PAHO for strengthening the capacities of technicians, professionals, and decision-makers involved in the water and sanitation sector of Latin American and Caribbean countries to identify seismic risk factors and implement preventive or alleviation measures to manage possible damages.